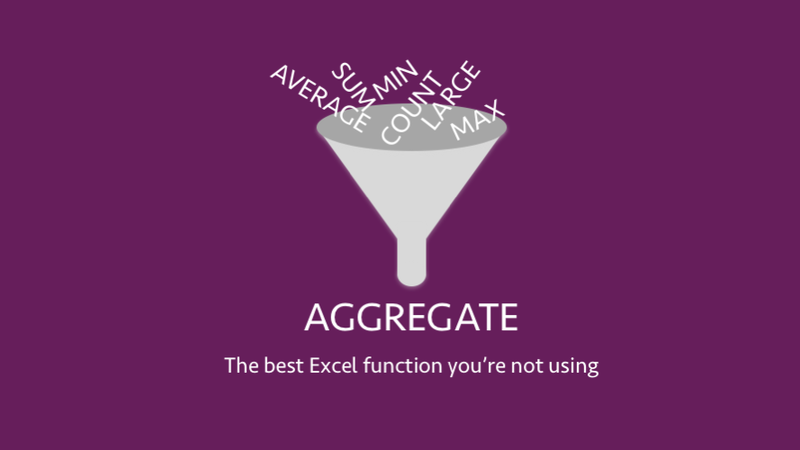 In Excel 2010, Microsoft introduced a new function called AGGREGATE. 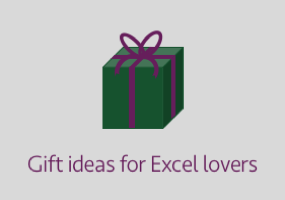 It is one of the most powerful functions in Excel, yet I’ve rarely seen it used in a real-life scenario. My aim with this post is to show you how good AGGREGATE is, so that you can make use of its power. Its name is deceptive. What does the word aggregate mean? To form a whole from separate parts. That sounds the same as SUM doesn’t it? Hence the problem with its name, the AGGREGATE function does so much more than SUM. 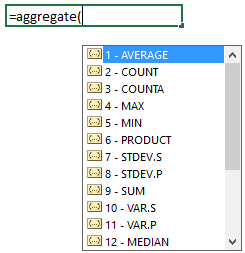 AGGREGATE can COUNT, AVERAGE, MAX, SMALL and SUM, to name just a few. But it’s better than those functions because it performs all of those whilst ignoring errors, hidden cells and other cells containing AGGREGATE and SUBTOTAL functions. To help you see the power, let’s consider some scenarios. Let’s say you want to find the 2nd largest result over a range of cells where those cells contain an #N/A error. We would typically turn to the LARGE function for this type of calculation, but in this circumstance, LARGE will return an error. We can tell the AGGREGATE function to ignore the error, enabling it to calculate the correct result. The screenshot below shows the result of both the LARGE and AGGREGATE functions. As a second example, what if you want to find the average of the visible cells. The AVERAGE function will calculate using all the cells in the range; it does not care whether those cells are visible or not. We can tell the AGGREGATE function to ignore hidden cells, enabling it to calculate the correct result. The screenshot below, in which row 5 is hidden, shows the average of the visible cells should be 38,750 (as calculated by AGGREGATE), not 71,000 (as calculated by AVERAGE). As a bonus, AGGREGATE can also process arrays for specific functions without the need for Ctrl + Shift + Enter. If you don’t know what that means, don’t worry. But if you do, you’ll know this is a big deal. You do not need to worry about which form you are using. 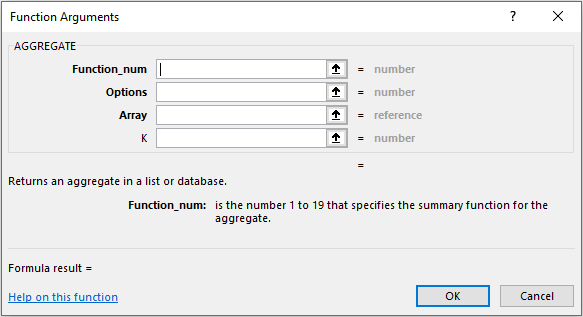 Excel will adopt the necessary form based on the function_num selected. Let’s consider each of the arguments in the function. A value from 1 to 19 which indicates the type of action to be performed. [ref2]: an optional additional range of cells. There can be up to 252 separate ranges (including ref1), each separated by a comma ( , ). If you think that AGGREGATE is complicated because there are too many things to remember, don’t worry. When you start typing the function into a cell or in the formula box, a drop-down will appear with the various options. If you decide to apply the function through the fx button, it is much less helpful. It requires you to select the format of the of the function (though if you select the wrong form and apply the arguments in the right positions, it will still calculate correctly). The Function Arguments Window does not provide any guidance on the function_num or options. Therefore, to use the AGGREGATE function, it is best to type directly into the cell or formula box, rather than using the fx button. Now that you understand the function a bit, we can start to look at a few examples. Notice that row 4 is hidden and Cell D6 contains an error. This formula is calculating the average (function_num = 1) of cells C2-C9, D2-D9 and E2-E9 whilst ignoring hidden rows and errors (options = 7). Whilst it is possible to include a single reference of C2:E9, this example shows each column of values individually. This formula is calculating the 1st largest (function_num = 14) value in the Range C2-C9 whilst ignoring hidden rows (options = 5). This example is much more complex. If you do not understand what it means, don’t worry. You can still use AGGREGATE without understanding this example. This example is an extension of Example 2 above. It now includes the requirement that 1st largest only be calculated over students from the St Johns school. If we tried to achieve the same result with the standard LARGE function we would need to press Ctrl + Shift + Enter, because it is an array formula. An example can be seen below, do not enter the curly braces, Excel will add those itself. AGGREGATE does not need Ctrl + Shift + Enter to be used when using the function_num 14 to 19. Before you get too excited, there is an issue here. 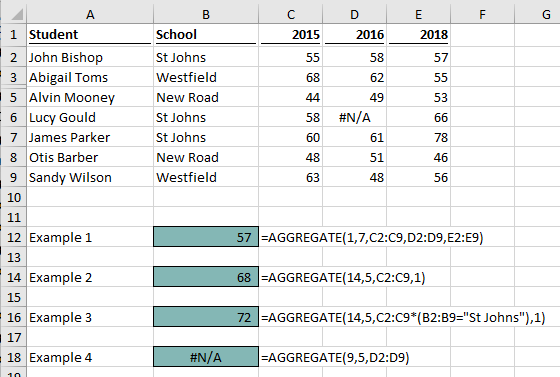 How is it possible that the largest value for St Johns is 72 when in Example 2 the largest value for all schools was 68? This is a quirk of array formulas. The 72 returned for St Johns is contained within the hidden row. We selected option 5 to ignore hidden rows, but this setting has been ignored. The array part of the function is calculated first, turning the cell references into values. As a result, there are no cell references to ignore. This is not necessarily a calculation error; we just need to understand how the formula works. This formula is trying to SUM (function_num = 9) the values, in Cells D2:D9 whilst ignoring hidden rows (options = 5). The result of the formula is an #N/A error because the cells included also include an error. As with all functions, there are some common pitfalls and problem. If a [k] argument is required, but not provided a #VALUE error will appear. For example, when applying the LARGE function_num, there needs to be an argument to find the nth largest item. Whilst there is an option to ignore hidden rows, there is no option to ignore hidden columns. When using an array which involves a calculation, the ignore hidden rows option is ignored (as shown in Example 3 above). If it’s good, why not use AGGREGATE all the time? If I have convinced you that AGGREGATE is a fantastic formula, then why not use it all the time? Most users do not understand the function. But there are just as many good reasons to use it too. Can do 152 different things (19 functions x 8 options), rather than just 1 (it’s a Swiss Army knife formula). There you have it, that’s AGGREGATE, the best function you’re not using . . . until today. Unreal, I can’t believe I’ve never heard of this. This will be super helpful. Thank you! That’s one convert… now you’ve just got to tell all of your work colleagues about it too. Your Advanced VLOOKUP Cheat Sheet is not loading. I’m sorry it wasn’t working for you. I’ll send you a copy. 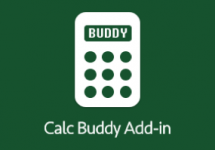 You will receive the Calc Buddy Add-in for FREE.